Ustad Rah Kumar Rizvi A Highly acclaimed Ghazal singer is one of the few Maestros in Raag Based classical gayaki in India. A Ghazal Maestro with a voice beyond comparison. He shared his style charismatic voice with his uncle and relative Mehndi Hassan Khansab. Today where the basic structure of Ghazal is changing drastically, Ustad Raj Kumar Rizvi carries on his legacy with traditional & original Ghazal Gayaki with classical extemporize. He sets the standards for the most popular form of ecstatic experience to the connoisseurs. His tantalizing rendition of romantic ghazals leaves the audience spellbound. The poetry and lyrics are masterfully performed in a smooth flowing and soothing voice with flute like resonance. His performance and recognition has positioned him to continue to be a highly respected & a world class Ghazal singer of his own style. He is also accompanied by his talented wife Indrani Rizvi Ma in music to her credit and giving a more blissful combination of a duo ghazal pair when they sing together. More famous as the musical Ghazal duo Raj Kumar & Indrani Rizvi. Rizvi was born in Rajasthan in to a musical family & Received training from his father & Guru Ustad Noor Muhammad of Kalawant Gharana. He also learnt sitar from Ustad Jamaluddin Bharatiya a disciple of Pandit Ravi Shankar. Raj Kumar ji also the credit of being the first disciple of Mehndi hassan Khansab. Ustad Raj Kumar Ji has a very distinct style of singing Rajasthani mand and folk music. 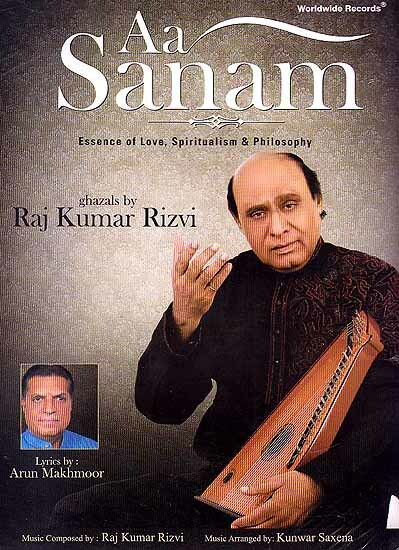 Ghazals that he sings are based on Raagas and has a unique way of connecting popular music wit ancient ragas often drawing attention of audiences of all ages. His pronunciations of poetry are precise emphasizing the aesthetic implication of the Ghazal and projecting its emotional content. Rizvi also rendered his voice for “Laila Majnu Do Badan Ik Jaan The” in the unforgettable film “Laila Majnu” in 1976.He also directed music as well as sang for Rajasthani film “Momal” which was enormously loved and appreciated by his fans especially in Rajasthan. Raj Kumar & Indrani Rizvi run Indian music institute as their mission to promote the importance and value of classical music and Ghazal gayaki among the younger talents of India. Since the last 10 years Rizvi spends most of his time conducting workshops & giving performances all over USA, UK & Canada. Mainly conducting workshops & Performances Disha Arts Academy – Canada. Ustad Raj Kumar Rizvi has dedicated his life & Music highlighting the importance of Classical Ragas in Ghazal, Folk, Sufi, old & new Hindi Film composition. His passion & love fore music inspire him to teach younger generation the importance of classical ragas in every form of music. His main asset in life in his ever so supportive wife Indrani and their two daughters Runa & Neha who are carrying ahead their musical heritage & are extensively trained by them to sing every genre of music with equal élan. Currently he is working on his new project “Classical Ghazal on fusion” along with his musical daughters Runa & Neha.